What could cause one shoulder to sit higher than the other? | Podiatry Associates, P.C. What could cause one shoulder to sit higher than the other? Everyone looks in the mirror, but have you ever really looked at your shoulders? When one shoulder appears to sit higher than the other when you see your reflection, you could have developed a scapular instability. This is a condition where your scapula sits in an abnormal position. Even if this condition is not painful now, you may begin to develop pain the longer your scapula sits incorrectly. Eventually this could lead to further injuries, such as biceps tendinitis. To determine the best path forward for treatment, you will need to have your shoulders examined and the severity of your condition assessed. 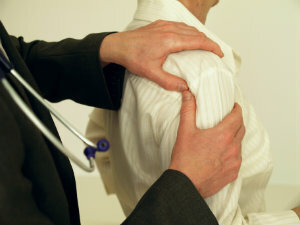 Don’t wait for your misaligned shoulders to lead to complications—contact Castle Pines Physical Therapy or Cherry Creek Physical Therapy for more information or a one-on-one appointment with our expert physical therapy staff. Call (303) 805-5156, or visit the online contact page to reach us.